This DOOG dog towel is perfect for after swimming, bathing or outdoor fun with your dog. The DOOG Swim Towel is made from anti-bacterial, quick dry material and is the must-have accessory for owners of hounds with a penchant for water sports. The DOOG Swim Towel is great for reducing the smell of wet dog hair. These DOOG dog towels are great for drying off wet dogs after a swim in the sea or a run in the rain. Applied straight afterwards these will keep smelly dogs to a minimum. 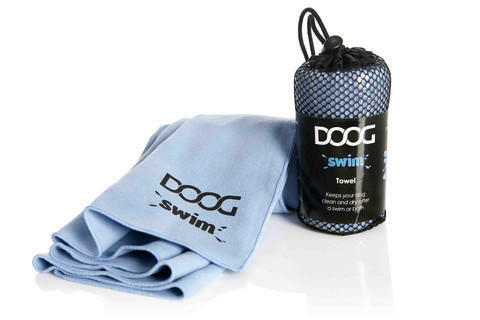 The DOOG dog Swim Towel is light and portable, great for travelling. Keep one in the glove box or hang it from your Walkie Belt’s carabiner by the neat little airing pouch. It acts like a chamois so you can wring it dry and re-use it in no time.